CENTRAL PA RACING SCENE: Shane Stewart Holds Off Schatz on Night #1 of the 56th Annual Knoxville Nationals! Shane Stewart Holds Off Schatz on Night #1 of the 56th Annual Knoxville Nationals! KNOXVILLE, Iowa (August 10, 2016) – For the third year in a row, and fifth time overall in Knoxville Nationals preliminary competition, Oklahoma’s Shane Stewart parked the Jeff Gordon Foundation No. 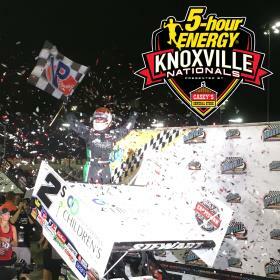 2s in Victory Lane; winning Wednesday’s Brandt Professional Agriculture Qualifying Night to open up the 56th annual 5-hour ENERGY Knoxville Nationals presented by Casey’s General Stores. It was Stewart’s second consecutive year topping the Capitani Classic and his Knoxville Nationals prelim night. The $12,000 score is Shane’s tenth overall win at the Knoxville Raceway and win No. 6 on the season with the World of Outlaws Craftsman Sprint Car Series. Referencing the words of Ralph Capitani, warning that Shane would be tough to beat, Shane stated, “I hope you’re interviewing me one more time this week. Man, I tell you what, I’ve got a great car right now, but I know that we’re going to have to pick it up just a little bit more to beat that No. 15 (Donny Schatz). He’s just so darn good here on the bottom and I have so many people ask me how he’s so good, but he just…everything just slows down in the racecar for him. He’s so good at changing lanes and not scrubbing off speed, so I’ve got to get better at that if I’m going to beat him”. Gridding the field fourth, Stewart gave chase the first nine circuits as Jeff Swindell took off with the lead over Wayne Johnson from the front row. Into third on the third round, Stewart carefully closed in on the No. 47. Setting up Swindell for the pass on Lap 9, Stewart made the slide through turns one and two but was denied the top spot. Regrouping on Lap 10, the slide came again through the first two turns. Leaving almost no room for error, Swindell was forced to roll out of the throttle, taking away enough momentum for Stewart to hold off the turn to take the lead. Under caution on Lap 12 for Lynton Jeffrey, who lost a wheel on the No. 12 machine, Shane no longer had Swindell to contend with, as Donny Schatz had moved into the runner-up spot on the eleventh round. Charging low on the No. 2c, the No. 15 was kept at bay by 0.012 seconds to complete Lap 13. Taking the lead the following lap, his advantage was short lived as Stewart drove back to the point. Slowed again with eight laps to run, Stewart got the jump on the restart, but Schatz was quick to pick up the pace, challenging again for the top position on the podium on Lap 19. Now three times denied, the nine-time champion watched as Shane pulled his advantage to 1.390 seconds at the drop of the checkered flag. Coming from eighth, Daryn Pittman brought the Great Clips No. 9 to fourth with Jamie Veal from seventh to complete the top-five. Having to start 20th on the field, Greg Hodnett was the highest finishing Pennsylvania driver on the night with a hard charging run to sixth in the Heffner Racing No. 27. After leading early on, Jeff Swindell faded to finish seventh with Wayne Johnson also falling back to eighth. Ninth went to Rico Abreu with Dusty Zomer tenth after running as high as fourth in the opening laps. With 47 drivers drawing in for Wednesday’s Brandt Professional Agriculture Qualifying night, Heat Race wins went to Chad Kemenah, Paige Polyak, Rico Abreu, Dusty Zomer, and Greg Hodnett. The C-Feature was topped by Josh Baughman with the B-Feature going to Sammy Swindell. The night’s quick time was achieved by Daryn Pittman with a time of 14.791 seconds. Following Wednesday’s action, Daryn Pittman sits atop the points with 485. Jamie Veal is second with 477, followed by Donny Schatz, Chad Kemenah, and Shane Stewart who rounds out the top-five in standings with 472 markers. The 56th Annual 5-hour ENERGY Knoxville Nationals presented by Casey’s General Stores continues Thursday night! Tickets are still available! To order tickets, or find more information about the Nationals, visit www.KnoxvilleRaceway.com! A main (started), 25 Laps, NT: 1. Shane Stewart (4); 2. Donny Schatz (6); 3. Chad Kemenah (5); 4. Daryn Pittman (8); 5. Jamie Veal (7); 6. Greg Hodnett (20); 7. Jeff Swindell (2); 8. Wayne Johnson (1); 9. Rico Abreu (14); 10. Dusty Zomer (3); 11. Craig Dollansky (24); 12. Danny Dietrich (10); 13. Sammy Swindell (21); 14. Ian Madsen (22); 15. Matt Juhl (11); 16. Logan Schuchart (13); 17. Austin McCarl (12); 18. Daniel Harding (16); 19. Dakota Hendrickson (9); 20. Davey Heskin (15); 21. Colby Copeland (18); 22. Paige Polyak (17); 23. Johnny Herrera (19); 24. Lynton Jeffrey (23). Lap Leaders: J. Swindell 1-9, Stewart 10-25. Hard-charger: Hodnett.